You shall not [Arthur’s] Pass! Sorry about that bad joke, it’s not my (Alpine)Fault! 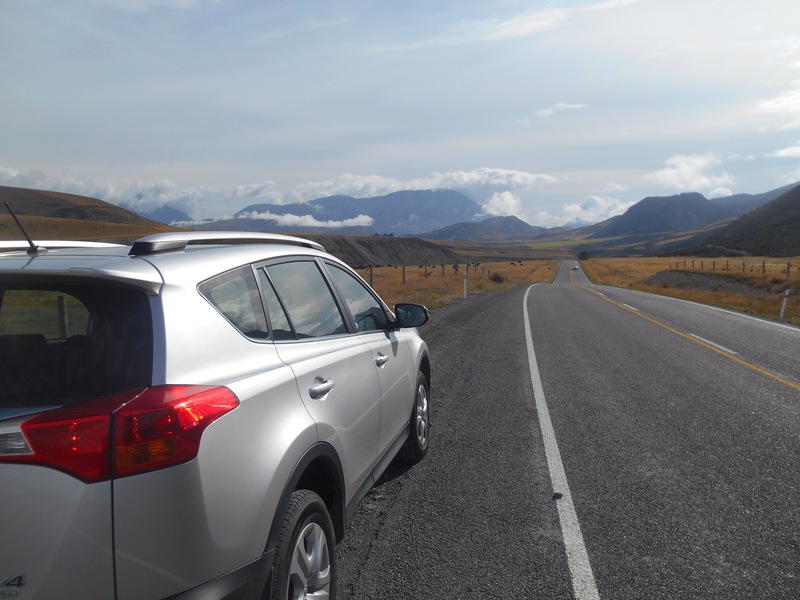 In an effort to complete the final ‘to dos’ on an ongoing New Zealand list, I opted to transfer hire cars as a means to see the country, retiring the bike. After a nights rest in Christchurch, I went to the airport to pick up my new ride, a very fancy Toyota RAV4. After a few obligatory rounds of the Christchurch suburbs and reconfirming that this is the most confusing city on the planet, I headed west. I would be relocating my ride to Greymouth meaning the car was free apart from fuel and insurance, and I get to do some exploring along the way. The Canterbury plains last for the first 80km, where all of a sudden the landscape transforms. Mountains and Valleys appear as if out of nowhere and every turn is a postcard view. I was almost having too much fun cruising to explore the sights, but Castle Hill proved an all too exciting formation to bypass. Massive limestone rocks, in the hundreds stuck out of the hillside. 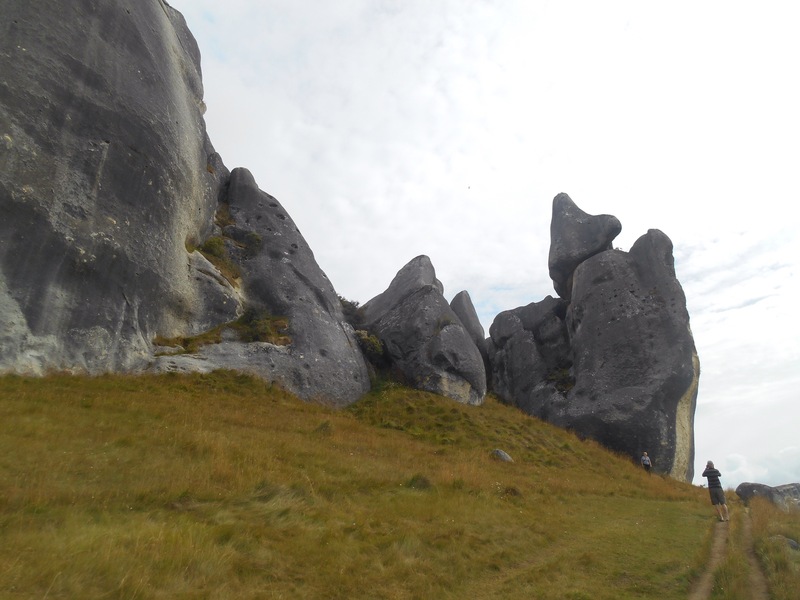 From the car park they formed a semicircle shape, in Maori legend a cloak of protection, however once you were in amongst them, the rocks felt like they were everywhere, towering over you in no apparent order. In the shapes you could conjure faces and animals within these grey giants, a mark of changing landscapes. The round wound past lakes and through hills. The scintillating view made more exciting by appreciating my comfy, regal transport. Entering the park, tracks went off in every direction but I continued to the town to get my bearings and pick a walk. 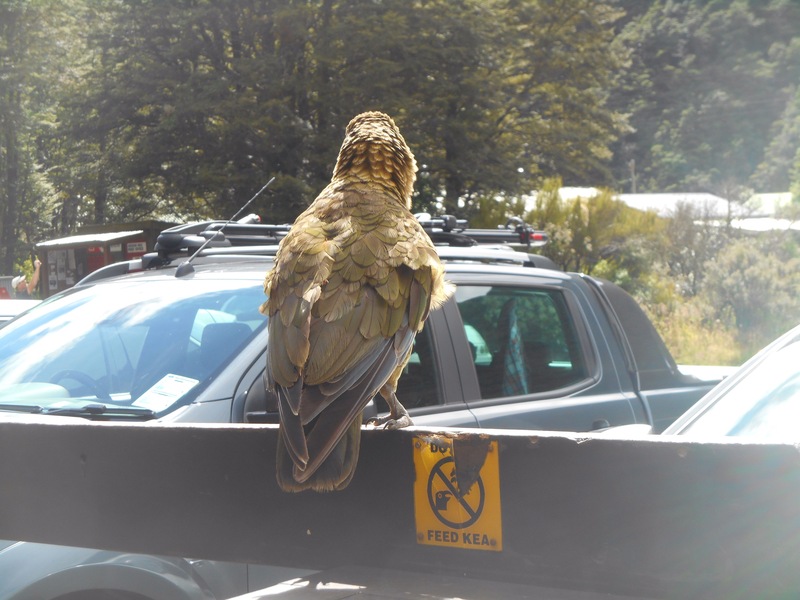 In the town was several Kea’s, the worlds only mountain parrot, an animal unique to New Zealand’s South Island. A cheeky bird with an awkward swagger and a menacing beak. They are known for undoing zips, eating rubber and being inquisitive. Oh, and they have no fear. I ordered a coffee and was soon joined by the cheeky bird almost poking his beak into my drink. From the top of the ski field, the size of the mountains could be better appreciated. It was also interesting to be travelling through these mountain ranges having previously cycled down one side of them (west coast) and up the other (east coast) using them as a dividing wall. 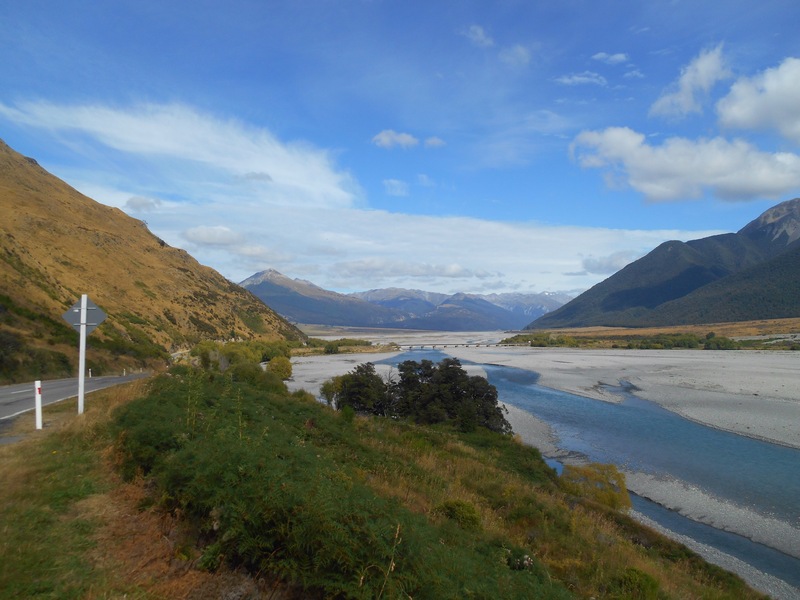 After that long and sweaty walk, I followed a boardwalk into the Otira valley. 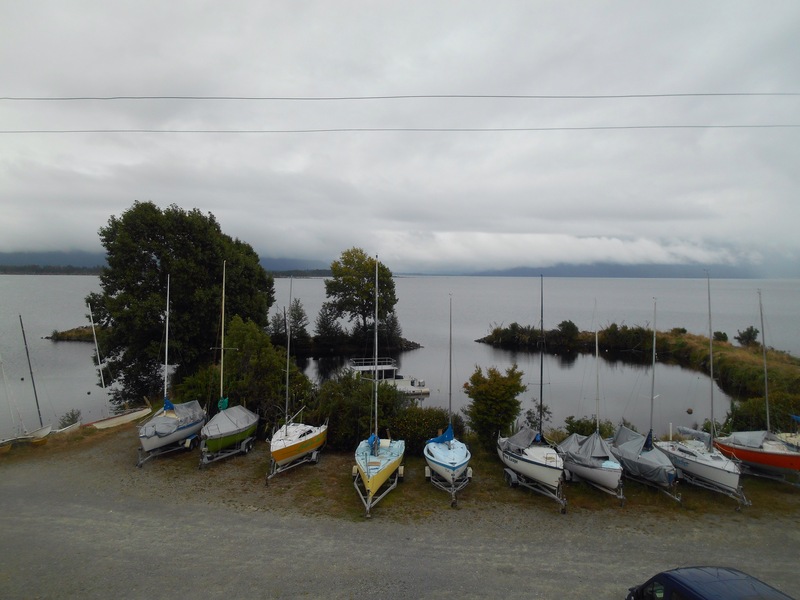 I could see the weather moving through slowly from the west coast, following New Zealand’s apparent unwritten rule to have contrasting weather on either side of the hills. Back in town, I followed the track to the Devils Punchbowl falls, the sun perforating between the moss covered trees of the forest. The first sight of the 131 metres stream of falls is incredible, and as you get closer, the movement of the water, flying off as a trickle from the top into plumes of spray which move more like an explosion of powder than water. 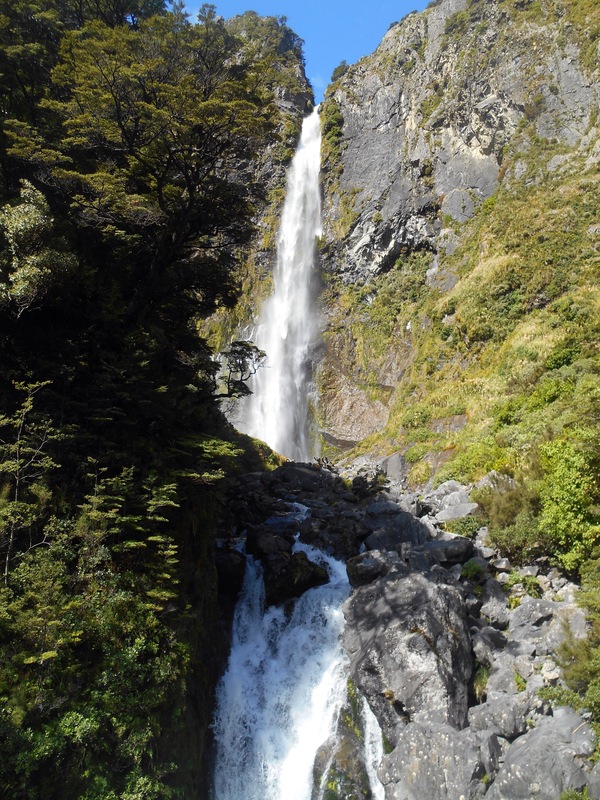 I feel they have claimed the top spot in New Zealand’s waterfalls so far. I pitched the tent at the edge of the township and was shortly after told stories of what the cheeky Kea’s had been up to only nights before, puncturing tents and air mattresses. Sitting on the phone that evening I was distracted (sorry Nally) by the team of two, and then more Kea’s turning their attention from a campervan step, to the neighbours tent, towards mine. Strolling over to them did no good as they boldly returned seconds later, so I opted to take the tent down and sleep in the back of the car. In the morning I drove through the small township and out into the Valley where just beyond the mist hung. 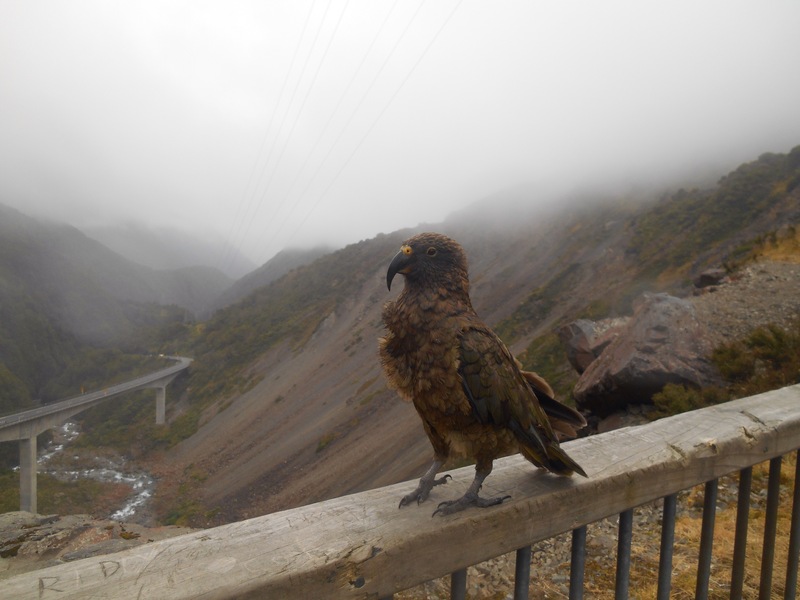 At the viaduct lookout I had my coffee and breakfast, mindful of the Kea who appeared keen to share. 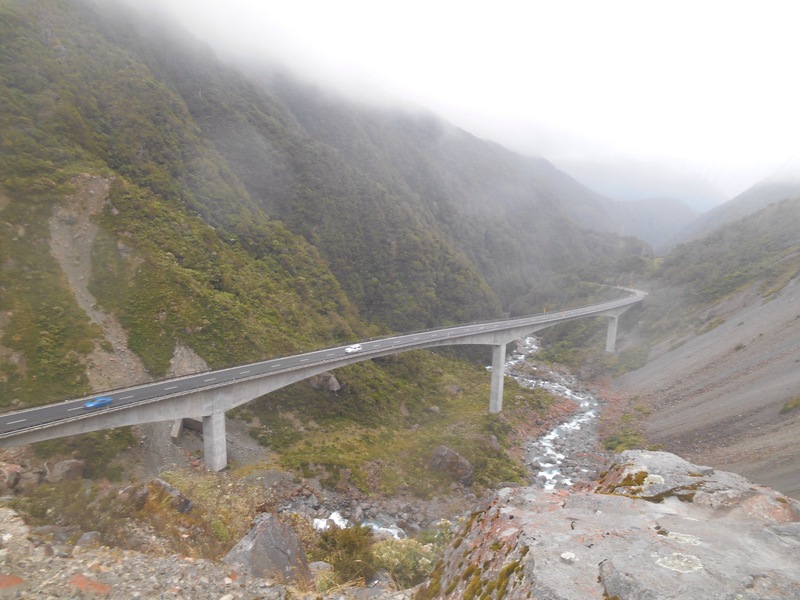 The lookouts showed the steeply declining, windy road and tunnels I would soon be passing through to get to Otira, some 14kms further but 300 metres below. Towards the coast I passed through Moana to see the impressive Lake Brunner. The mist had lifted and the giant lake stretched out to the hills beyond. I walked along the foreshore in the cool morning, observing kayakers and dog walkers from the grey stone shores. I drove on to Greymouth, stopping at the remains of ‘Brunnerton’ on the way. 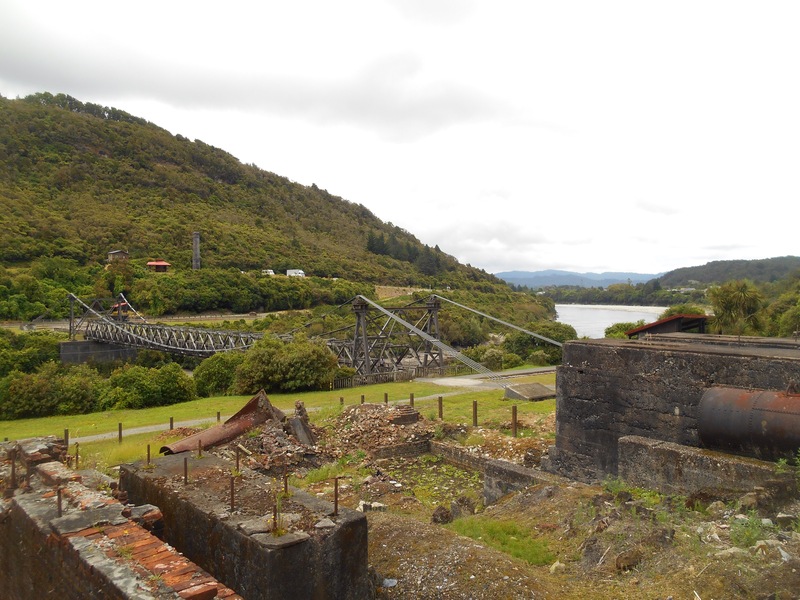 The remains of this once bustling coal mining settlement are now a memorial to a once flourishing trade and New Zealand’s worst mining disaster, Black Thursday. 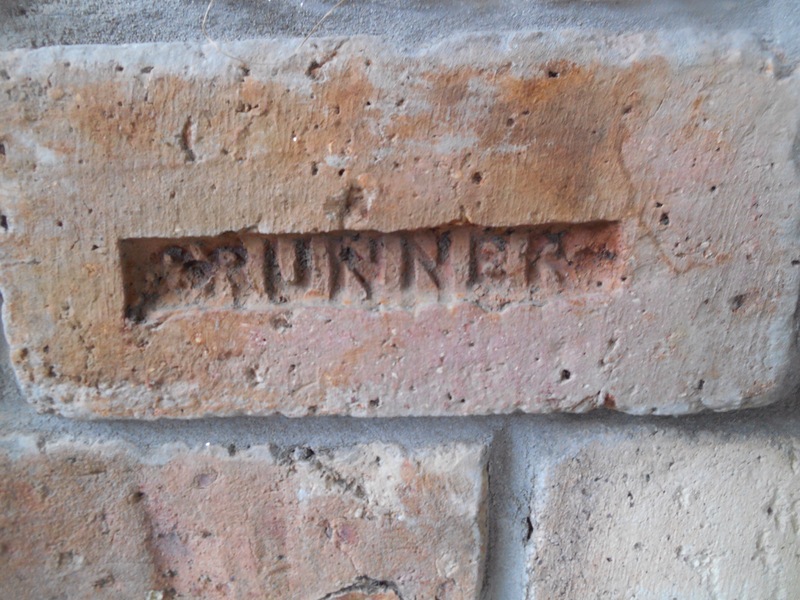 Thomas Brunner, the first European to see this area, made the discovery of the potential of coal mining in this area and it was subsequently filled with expats from England’s coal mining towns. Later, on 22 March 1896, an underground explosion lost 65 men and boys their lives. As trade declined, this settlement diminished, now leaving brick remains and an impressive bridge over the Grey River. As I drove into Greymouth it was nice to see the sun shining over the town. I returned my comfortable chauffeur and collected my tickets for the Tranz Alpine journey which would take me back to Christchurch. 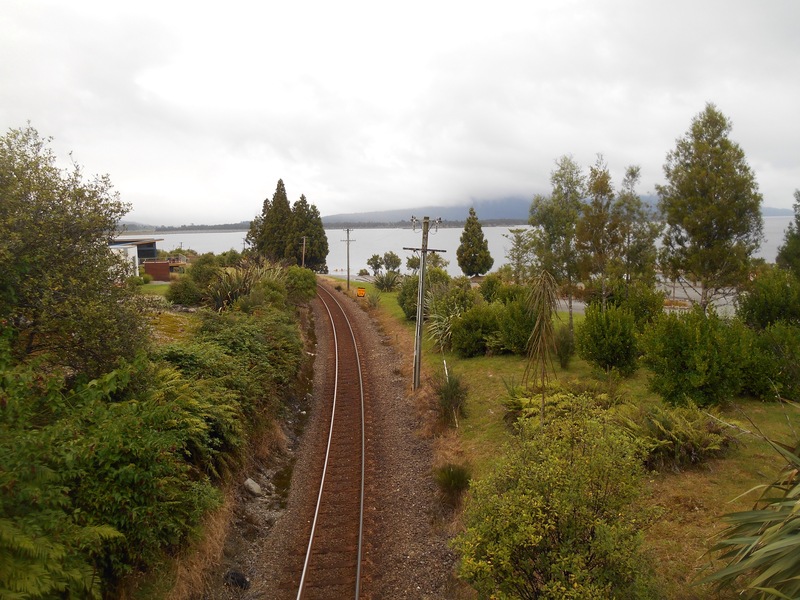 The train left slightly later than planned, pulling out of the west coast town at 2.30 and quickly passing back through into rural landscapes and lakeside Moana. 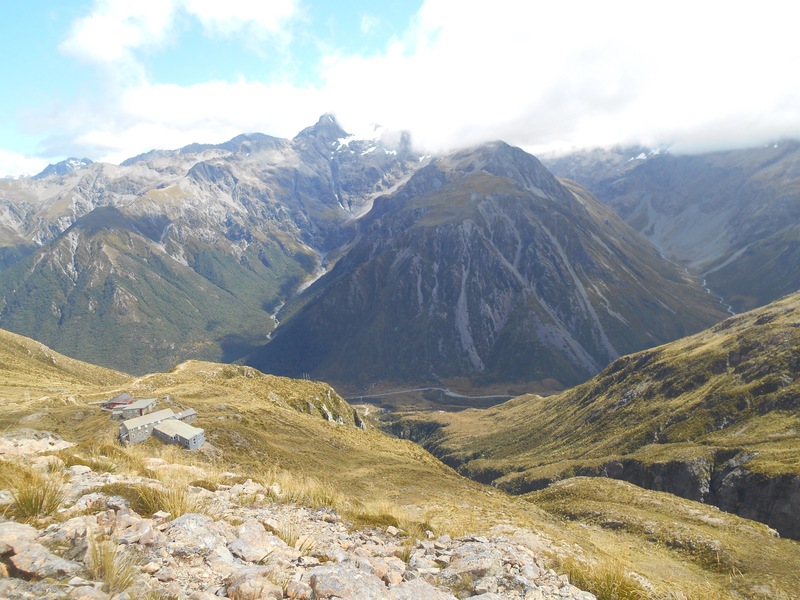 We began towards the southern Alps, the mountainous backbone of the South Island caused by the Alpine Fault, the meeting of the Australian and Pacific plates. 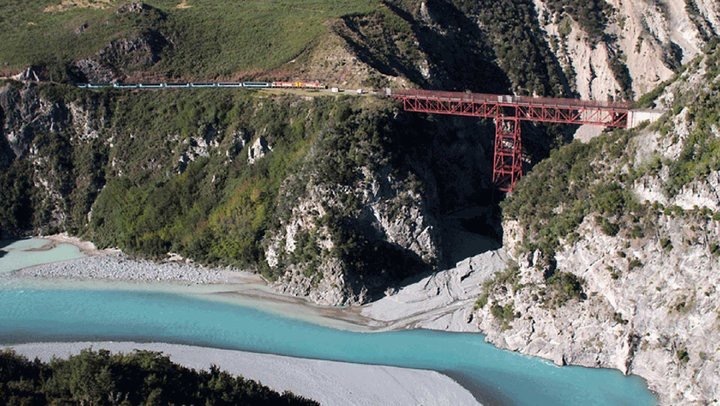 The train passes through the divide which forms part of Arthur’s Pass. Nearby, ‘The Deception’ and ‘The Hoax’ are passes which were found by Arthur’s brother, George Dobson, in a failed attempt to found the path to the west coast. At this point the train took an alternate route from the road which climbs steeply over the mountain. 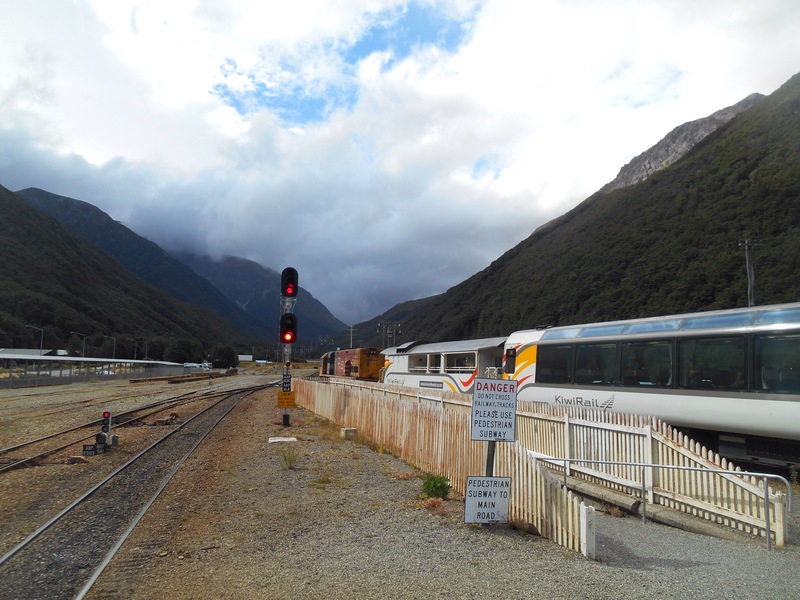 From Otira, the train enters an 8km tunnel burrowing through the mountain. 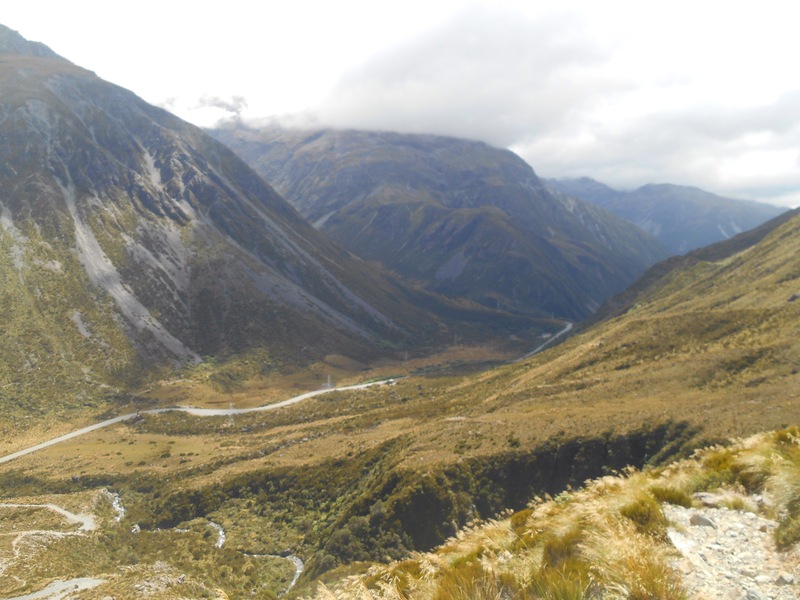 Otira sits in the valley some 14kms from Arthur’s Pass but 300metres lower. Before the railway joined these two stations, coaches would pass a treacherous route to make the path for goods and passengers reaching the west coast. With modern technology, the train line was eventually able to meet the climb up to Arthur’s Pass station. 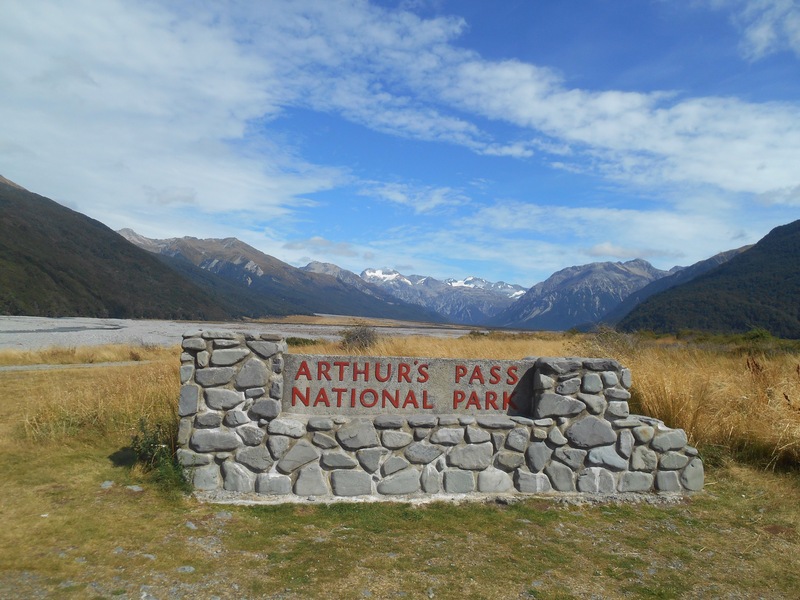 Once more, whilst the fog hung in the valley, Arthur’s Pass was clear blue skies and sunshine, if not a little brisk. The next section of the journey was my favourite. A series of 16 tunnels and viaducts , the highest being the 73 metre high ‘The Staircase.’ Then the valleys form big basins, mostly filled with gravel with several winding streams making their way through. The water is that unreal aqua that is so associated with New Zealand. At some point the river bank meanders changing direction almost entirely. We then crossed tussock country, the brown grasses and shrubs which belong to the sheep of the large stations which span this area. Springfield marks the end of the start of the Canterbury plains, apparently flat until the far off volcanos of the Banks Peninsula in the far distance. We pulled into Christchurch at 7:30, and I made a quick dash across town to meet Shanelle, Greg and Meryl at an amazing pizza restaurant where we (or I) gorged on too much pizza, exchanged news from the two month interim and caught the end of a burlesque show. 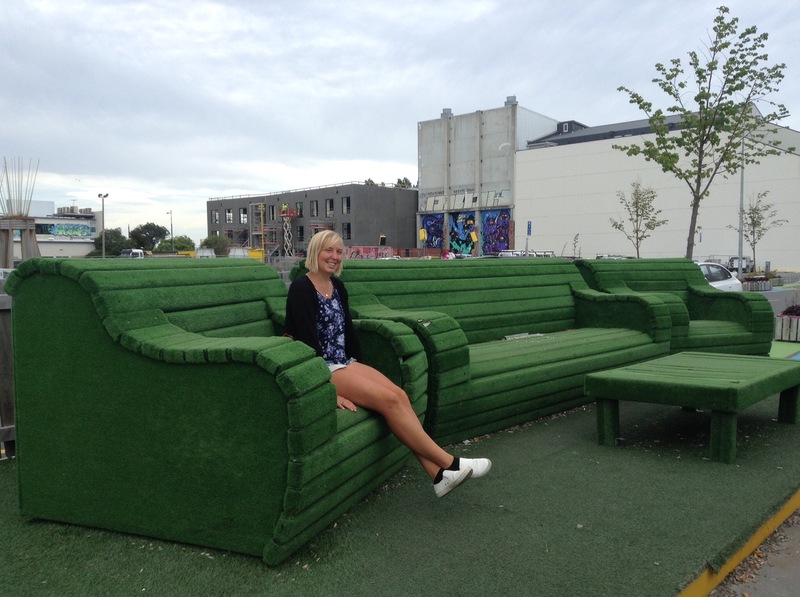 One last day in Christchurch and I met Cara, (a German traveller who you may remember from Queenstown) to spend the day in the city. Going from tourist to tour guide, we walked the streets as I shared my nerd anecdotes, as always commenting on the street art of the city. Even since my last visit the city has changed. 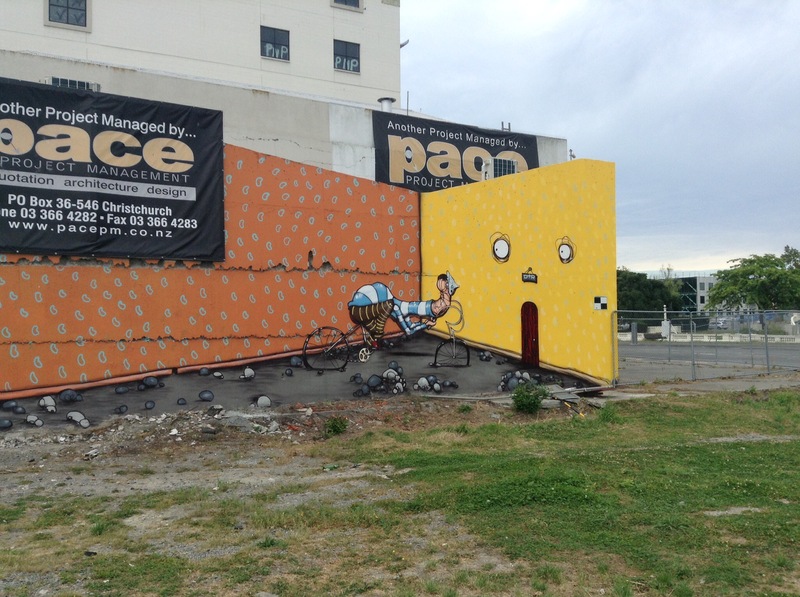 The multi million investment has paid off meaning that the arts centre has newly reopened, new summery installations continue to extend Christchurch’s fame as the garden city, and it’s colourful art continues to evolve. The day was humid and we spent a while relaxing in the botanic gardens, before heading across town to a newly opened playground. 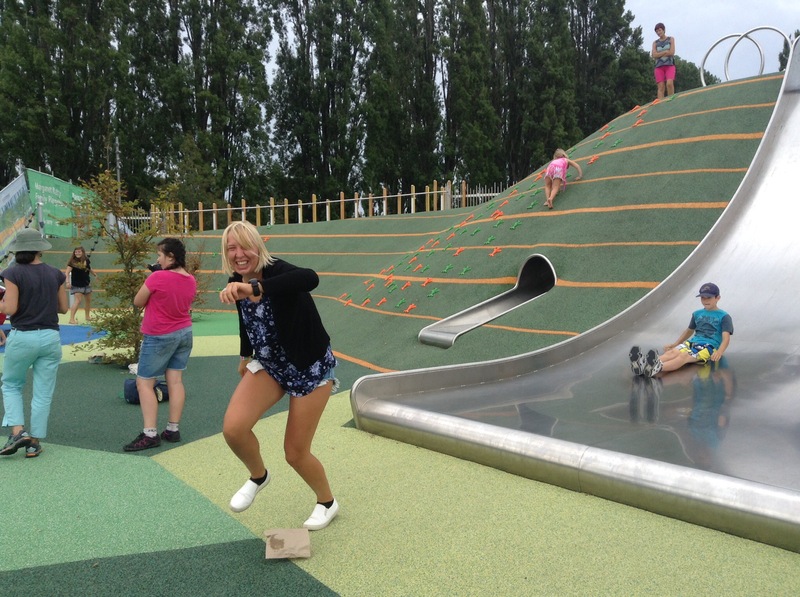 The Margaret Mahy playground had so much to keep kids, and older kids like us, entertained. 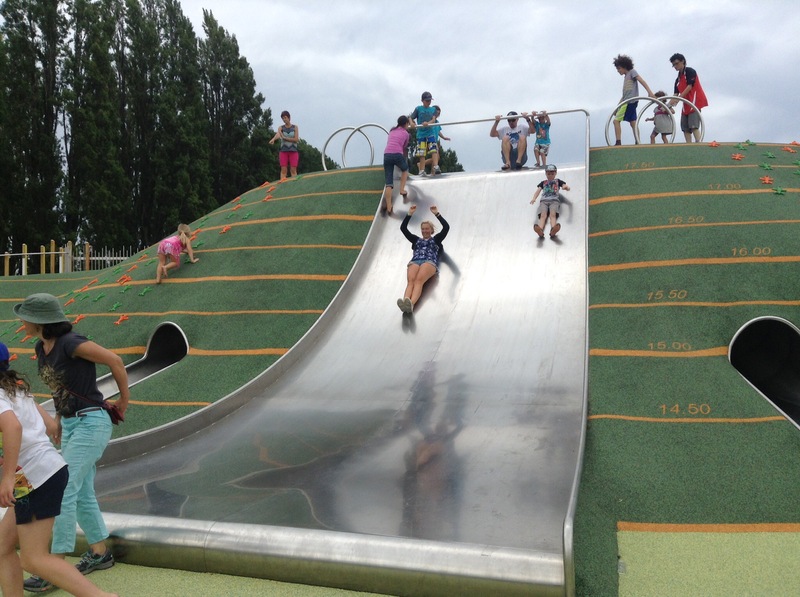 We patiently waited our turn to race on the flying fox, bounce on the trampolines, make ourselves dizzy on the spinning sticks and fly off the end of the giant slide. We fuelled ourselves up with ice cream and then did it all over again. From this vantage point in the city, the gaps where buildings used to be are obvious, as I had seen humorously pointed out earlier in the day, Christchurch now has more car parks than cars (and are obviously happy to laugh at themselves about it!) The odd flat spot in between buildings reminds me of the gappy grin of a child loosing their teeth. 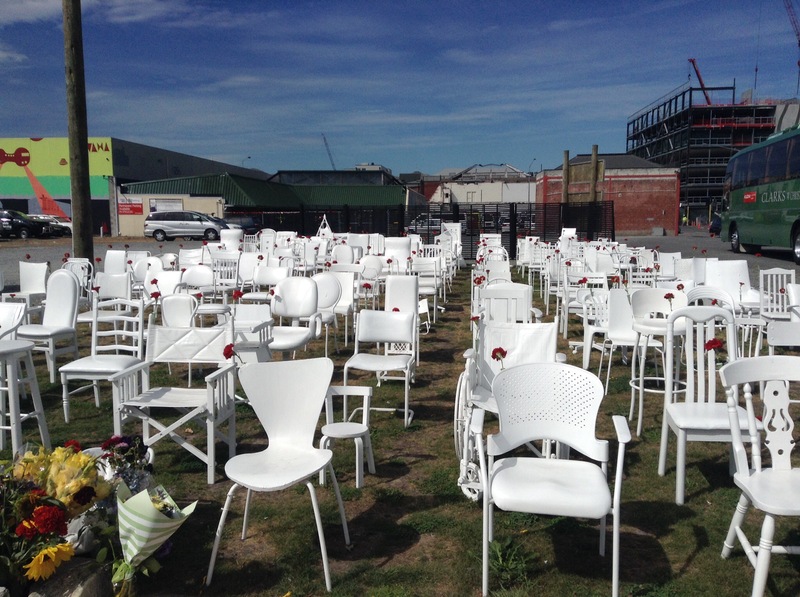 One thing to mention is its 3 days since the 5 year anniversary of Christchurch’s fatal earthquake. This is strongly recognised through the city marked with flowers and memorials. It is also 12 days since a pretty major 5.7 earthquake. The reminder is a bit too scary of the danger and memory of the recent past. Staying with my friends part way to Sumner Beach, the area that suffered most recently, you can see the effect is unnerving, even by their two small dogs who sit at your feet or under Shanelle’s desk somewhat nervously. A poignant reminder to the ongoing activity here. 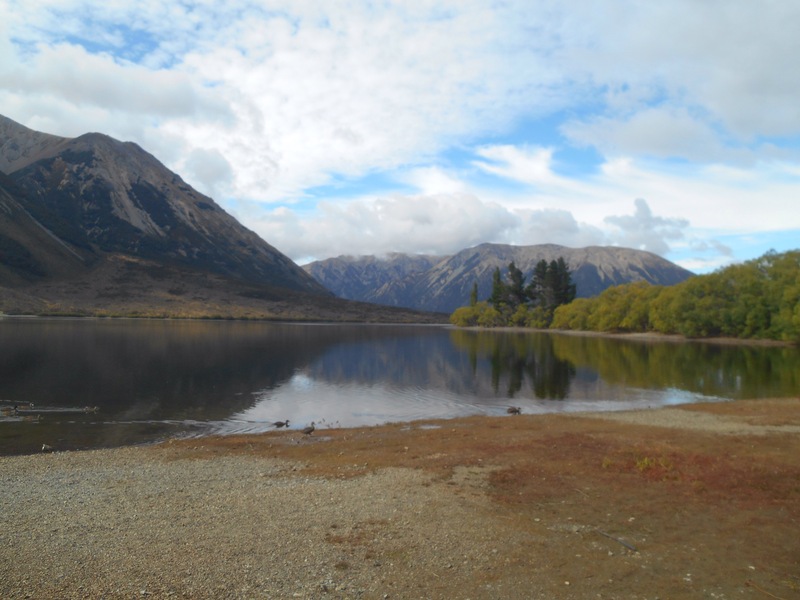 Glad you enjoyed the drive across Arthur’s Pass and you did all the things I always recommend to my guests to make the most of the drive. Don’t blame you for giving up on the tent for the night – don’t know that I’d like to spend the night with the Kea, cheeky brats they are lol. Yes I’m so glad I could return and see this section and it treated me well. Lovely to see Greymouth in the sun as well!